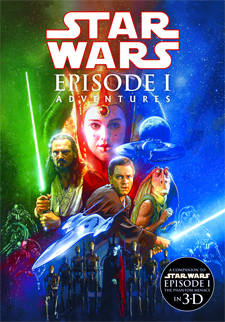 With the Star Wars 3D Movie logo on the cover of Dark Horse’s Star Wars: Episode I Adventures, it is clear that the comic company (along with many other licensees) is now gearing up for the 3D Re-release of The Phantom Menace scheduled to be released on February 10, 2012. Despite the negative outlook on the prequels by vocal movie fans, I am sure there are some, almost 13 years after its first release, nostalgic enough and looking forward to the 3D screenings — and prequel fans will undoubtedly be excited too. However, this collection of Episode I-related narratives isn’t quite for everyone, although there are some positive elements to the book.